PFIA 1 is a simple measuring device used with a chord line for the determination of versines. The measuring set-up is especially suitable for measurement and verification of versines during track re-alignment. PFIA 1 is clamped to the rail foot with its own clamps. 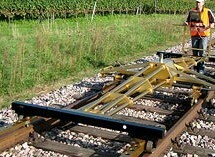 The device may be used on tracks and turnouts with rails foot sizes from 125 to 150 mm. Chords up to 80 m may be set out, while versines up to 800 mm may be measured. The measuring device is also best suitable for use during switch tamping and lining as well as switch re-construction, because the slewing force of the tamping and lining machine may be used at these critical alignment points. 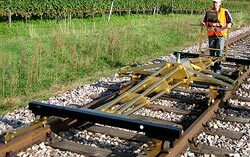 Since the line can be left clipped to the reference rail even across check rails, the versines can be check throughout the tamping and lining procedure as well as on the section already finished. A complete set of measuring bars consists of 2 end bars (± 200 mm) and 1 middle bar including scale (± 700 mm). The measuring bars are made of T-section aluminium and printed in a scratchproof Eloxal process. the measuring bars are insulated and officially approved by DB.